Rachel Lester always had an interest in working in the medical field. Unlike some of her other colleagues, however, she didn’t decide to fully pursue it until after graduation when she received her diploma from Ohio University. With a degree in communications, Rachel began working as a home health aide for Community Caregivers when she decided to pursue her prerequisites to continue her education in nursing. It was during that time that she fell in love with nursing and found her lifelong calling. While pursuing her masters in nursing, Rachel knew she wanted a specialization in something that would give her a wide scope in her practice. Becoming a Family Nurse Practitioner (FNP) instead of a traditional Nurse Practitioner (NP) made it possible for her to see patients across the lifespan. Working as an FNP has allowed her to work in a variety of areas including Pediatrics, Women’s health, Geriatrics, and more. Currently, Rachel is working at AxessPointe in Akron in the Internal Medicine clinic. This means she sees both men and women who are suffering from issues like diabetes, hypertension, heart problems, depression, and anxiety. 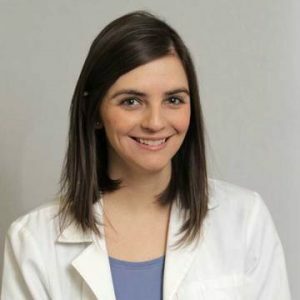 Her practice also includes providing women’s health services such as cervical and breast cancer screenings as well as STD treatment and screenings. In addition, she also performs physicals for workplaces and schools, cares for acute issues, performs immunizations, and assists in screenings for breast and colon cancer. Working at AxessPointe has allowed Rachel to focus on the whole patient when they come in for a visit due to the fact that it is a federally qualified health center (FQHC). This means they provide both primary medical care and dental care in under-served areas and promotes collaboration amongst the entire healthcare team which is easier and more convenient for patients. Rachel’s favorite part about being an FNP is hearing stories from her patients and learning about who they are so she can gain insight into their lives and provide them with more holistic care. When asked about the most rewarding part of her job, Rachel explained that it was, “watching patients succeed toward their goals and serving as their guide through that journey”. Something she always explains to her patients is that they know themselves the best so they are their own best advocate. She wants her patients to understand that her job is to serve as their guide and educator but health and wellness is a team effort on both sides. Rachel is a proud resident of Northeast Ohio and loves the smaller, connected community feel which has given her the opportunity to serve as a preceptor for other Nurse Practitioner students for places like The University of Akron, Walsh University, and the University of Cincinnati. She is a current member of the Ohio Association of Advanced Practice Nurses and American Association of Nurse Practitioners and serves on the Quality Control & Risk Management Committee for AxessPointe as well as the National Health Service Corps.